The bluffs rise right out of the river along both sides of the stretch from Harpers Ferry to New Albin, Iowa. Parts of the highway on the both sides sport concrete barriers to keep the rocks shed by the bluffs from rolling onto the highway. In Iowa, the river road retreats up to the ridge in a couple of stretches where there was barely room to carve a narrow notch for the railroad tracks. Harpers Ferry is just upriver from the Effigy Mounds National Monument. The site was once covered by hundreds of Indian mounds. Dozens remain, especially in parks and the Sandy Point Cemetery. Harpers Ferry is a quiet place in the winter, with only 330 residents, but in the summer several thousand people populate the trailers and cottages in town, most to be close to the maze of sloughs and backwaters in the river. Lynxville (pop. 176) and Ferryville (pop. 174), Wis., are both long narrow villages stretched out along Highway 35 between the bluff and the river. Many older limestone buildings decorate Lansing, Iowa. This city of 1,012 has a strong river heritage. In fact, the largest employer, Blumenthal Lansing Company, with about 130 employees, makes buttons and started out more than 100 years ago making buttons from river mussels. The Black Hawk Bridge at Lansing was built in 1932 and will probably need to be replaced or upgraded soon. 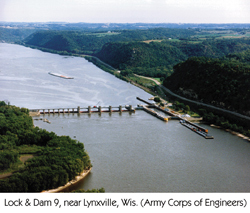 A few years ago transportation officials considered closing it, leaving the 63-mile stretch of river between Prairie du Chien and La Crosse, Wis., without a bridge. David Lynchs movie The Straight Story features an aerial shot of the hero driving his riding lawn mower across the bridge to visit his brother in Wisconsin. Locals recognize that hes actually travelling in the wrong direction. Mount Hosmer Park, on the bluff overlooking Lansing, offers spectacular views of the river and the town below. The bluff is named after sculptor Harriet Hosmer, who, while traveling on a steamboat in 1851, challenged a clerk to a foot race to the top. She won. The founders of DeSoto, Wis., (pop. 366) originally intended to only allow former New England residents to own property and businesses. When a large sawmill began operating in 1857, the need for laborers brought an end to the plan. The Black Hawk War ended with a massacre on the banks of the Mississippi at Victory, Wis., on August 1, 1832. Black Hawks band of Sauk and Mesquakie (Fox), which included women, children and the elderly, had tried to surrender several times to the Army and militia that had pursued them from Rock Island, Ill., and up the Rock River to near Madison, Wis., and back west to the river. The gunboat, Warrior, called up from Fort Crawford in Prairie du Chien, Wis., shot many of the band as they tried to swim across the river. Most of those who made it across to Iowa were killed by a war party of Dakota waiting there for them. The names Victory, Battle Slough, Battle Island, Battle Hollow and Black Hawk Memorial Park recall that bloody day. The battle site is now a popular park and campground managed by the Army Corps of Engineers. 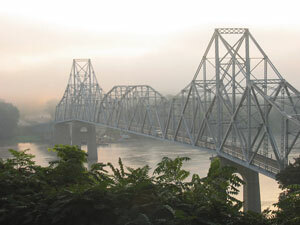 Across the Mississippi is the delta created by the Upper Iowa River, a popular canoeing river. Just south of the Highway 26 bridge across the Upper Iowa, Fish Farm Mounds State Preserve contains a large group of Indian mounds on a low bench above the floodplains. This article first appeared in the March-April 2003 issue of Big River magazine, 1-800-303-8201. Copyright 2003, Open River Press, Inc.